The mummified body was found in the ancient Persian village of Makhunik in what is now Iran. The discovery caused an international sensation when researchers reported that the remains belonged to an adolescent dwarf and that excavations of the ancient town revealed architecture that suggested it was a city of little people. The story has now resurfaced, following a report in PressTV, and is making its way rapidly around alternative news sites. Here we explore whether an ancient city of dwarfs really existed, or whether it is all just media sensation. According to The Circle of Ancient Iranian Studies, the discovery of the tiny mummy followed two months of illegal excavations in the historical fortress of Gudiz in Kerman province near Shahdad city, which dates back to the time of the Sassanid Empire (224 to 651 AD), the last Iranian empire before the rise of Islam. The mummy was seized after the smugglers attempted to sell it for more than 3 million U.S. dollars in Germany. The 25-centimeter long mummy was well-preserved and covered by a thin layer, which was initially believed to be materials used for mummification but was later confirmed to be the individual’s skin. Initial analyses carried out by a forensic team estimated that the individual was 16 – 17 years old at the time of death. The discovery quickly added fuel to rumors already in existence about a dwarf city in Kerman province, with parallels being drawn to the ‘Lilliput City’ described in Jonathan Swift’s famous novel, Gulliver’s Travels. Reports started filtering through of homes and buildings excavated in the ancient village with walls only 80 centimeters high. 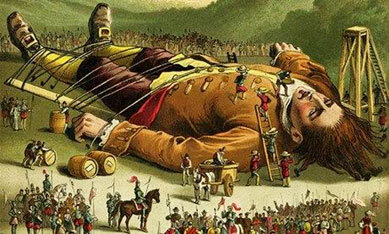 An illustration from Gulliver’s Travels, depicting Lilliput, the land of little people. Image source. The Iran Dailyadded to the sensation by claiming that the ancient village in which the mummy was found did not date to the Sassanid era, but was actually a 5,000-year-old ‘City of Dwarfs’. The buildings were found to have low walls, only suitable for dwarves, according to Iran Daily. Archaeologists were quick to debunk the rumors of the existence of such a city in the province: “The 38-year archaeological excavations in Shahdad city deny any dwarf city in the region. The remained houses which their walls are 80 centimeters high were originally 190 centimeters. 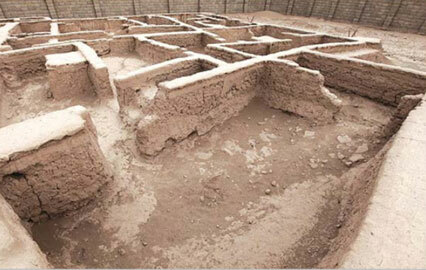 Some of the remained walls are 5 centimeters high, therefore should we claim that the people who live in these houses were 5 centimeters tall?” said Mirabedin Kaboli, head of archaeological excavations in Shahdad city. Other experts ruled out the possibility that the mummy proves that Makhunik was a city of dwarfs, but stopped short of dispelling local legend of such a city altogether: “Even if it is proved that the corpse belongs to a dwarf, we cannot say for sure that the region of its discovery in Kerman province was the city of dwarfs,” said Javadi, archaeologist of the Cultural Heritage and Tourism Organization of Kerman province. reported that anthropological studies revealed the small mummy was actually 400-years-old and did not belong to a dwarf at all but to a premature baby that had been mummified through natural processes. “The skeleton belongs to a premature baby who, due to regional conditions and its burial method, has been mummified under natural processes,” said Farzad Forouzanfar, an anthropologist of the Cultural Heritage and Tourism Organization of Iran. So what can we conclude about Makhunik and the tiny mummy? It appears that much of the media reporting regarding the case has been spurred on by rumor and misrepresented through sensationalism. It seems most probable, the mummy is the naturally preserved remains of a baby, as anthropological studies revealed. Nevertheless, it is curious that legends of “little people” do not just exist in Iran but can be found in many cultures around the world. 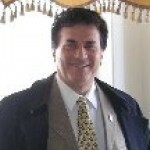 According to Dr. Susan Martinez, author of ‘The History of the Little People: Their Spiritually Advanced Civilizations around the World’, an ancient race of people who were small in stature once inhabited the Earth. She refers to legends and stories from many cultures, such as the dwarf gods of Mexico and Peru, the Menehune of Hawaii, the Nunnehi of the Cherokee, as well as African Pygmies and the Semang of Malaysia, and draws upon discoveries of tiny tunnel networks, small coffins, low doorways in mounds, and pygmy-sized huts, as evidence of this ancient race. 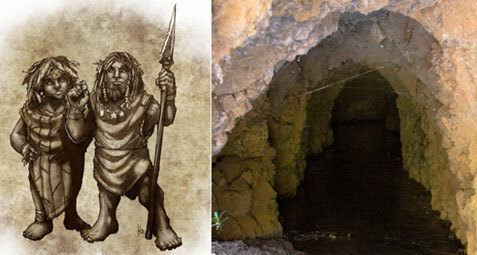 Left: Artist’s depiction of the Menehune. Image source. Right: A 2-3ft high tunnel network in Hawaii, believed to have been made by the Menehune. Photo source. I was surprised to learn that Native Americans also believed in fairies, and, then again, not so surprised. It seems that almost every culture has their own version of fairies or “little people.” With the Native Americans being so in tune with nature, why would their beliefs be any different from the ancient Celts and other Europeans? There is a mystery surrounding a “little mummy” that was discovered back in the 1930s in the San Pedro Mountains. Because the little mummy was discovered in a cave, it was speculated that there was a tiny race of humans that lived in caves in the mountains. This little mummy was sitting upright and had a flattened skull. It also had very tan skin and sat about 7″ tall. So, if it stood up it would have been a little over a foot tall! 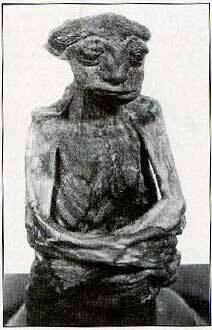 Could this little mummy have been proof of the “little people” so greatly believed in by the Native Americans? Unfortunately, the little mummy has disappeared since its discovery, so no further testing has been done on it since the 1950s. Most scientists who have studied the photographs claim that it is simply the mummy of an anencephalic fetus. But the question was posed as to why the little mummy would have a full set of adult teeth? If someone was to turn this little mummy into science, would we find that there was such a thing as the “little people?” Could they have been related to the many legends of the wee folk and faeries from the European continent across the Atlantic Ocean? MANY CULTURES AROUND the world have their legends and folklore about “little people” — elves , fairies , gnomes , elementals, or simply the “wee folk”. In Scandinavia they are the Tomte or Nisse; the Nimerigar, Yunwi Tsundi, and Mannegishi of various Native American tribes; the Menehune of Hawaii; and most famous, perhaps, are the Irish Leprechauns. Some of these wee folk are friendly, even helpful creatures, but mostly they have a reputation for being mischievous, conniving, and always elusive tricksters — seeming to live just on the edge of our reality. I live in Australia and wonder if anyone has heard of the woodarjee (spelling? pronounced wood-ah-gee). I learned of them a few years ago when relating a story to a Noongar friend of mine. Noongars are the main aboriginal tribe of Australia’s southwest, and in their lore, the woodarjee are mischievous, sometimes violent little people. Sometime during the month of August 2004, I was at a place called Pymatuning Park in Pennsylvania, picnicking with my family. I was ten. I had wandered off alone into the nearby forest and was looking at all the trees. I was walking around when I heard the sound of music. I followed it until I reached a clearing. Like a scene from a movie, sitting on an old stump on the edge of the clearing was a little boy. He looked like he was about seven. He had medium-length blonde hair and was playing a recorder made of wood. He must have heard me because he looked up at me. He had pointed ears and dark green eyes. He looked at me and smiled. He asked me if I would play with him. His voice was really strange, almost like a bell. I told him I couldn’t, and I had to get back to my family. He looked really sad for a minute, but then started smiling, and told me that it was okay, and he would wait until I could play with him. Then he stood up and walked off into the forest.
. He said he has never seen anything, but had only one weird experience when he was around 17 years old. He was hunting for elk with his father and brothers in Salmon, Idaho in 1965. They had all split up to chase down an elk herd they spooked by chance, and my dad was sent around the mountain by himself to cut them off. It was a mildly warm day and he stopped to rest in the shade of some large boulders to strip off some of his gear and have a drink of water. When he sat down to rest, he felt a rock zip right by his head. Thinking it was one of his brothers playing a trick on him, he yelled at them to stop. That’s when he noticed tiny footprints in the soft dust under his feet. And again another rock was thrown in his direction, closer this time. who barely escaped from the white man. They made their home in the hills and if bothered would put a curse on you if you failed to heed their warnings. Feeling a chill creep up his spine, he slowly rose, gathered his things and said in very slow Shoshone, “I am leaving. I’m sorry I disturbed you.” As he was walking away downhill he heard small feet slapping the rocks behind him, but being a tad afraid he never looked back. He never told his father or brothers and could hardly tell me for fear of me thinking he was crazy. I believe him. — Alex N.
They have their own rules of etiquette. Those who see the Little People should not look directly at them, they think it’s rude. If they catch you staring, they might point a finger at you, rooting you to the ground, while they take your belongings. Another rule is don’t speak of them in the summer when they are most active. But in return for kindness, they taught the Mohegan people how to grow corn and use healing plants. They keep the earth well and grant favors for those who honor their ways. When the English settlers came and disrupted the traditional way of Mohegan life, many forgot to help the Makiawisug. As a result, many Mohegans and Makiawisug fell ill. At this time of Bad Spirits, there lived a medicine woman. One night, during a terrible storm, she heard the whip-poor-will. When she looked outside, the bird wasn’t to be found, but a small boy stood in the rain on her doorstep. It turned out he was a grown Makiawisug named Weegun, who told her to come to help someone who was sick. Though the storm was fierce, he led her through the woods a long way. Suddenly, the storm seemed to stop as they began to descend into the ground. They were in the realm of the Little People. Wee-gun led her to a beehive shaped chamber of rocks. Inside, a very old woman lay in bed, very ill. The Makiawisug told the medicine woman that this was Granny Squannit, who must be made well. Granny Squannit is very powerful, and she is known to cause storms when she argues with her husband. Her illness was the reason for this storm. Worse, healers often look to Granny Squannit when the need is dire for help in healing, and here she was the one who was sick. The medicine woman treated Granny Squannit for nearly a moon before she got better. In return for restoring Granny Squannit’s health, the Makiawisug gave the medicine woman a basket of gifts and told her to remember them. She was blindfolded and taken back home. Only when she returned did she open the basket. Inside were quartz crystals, painted skins, and bunches of herbs. If you watch the documentary The Fairy Faith, a Native American tribe in Canada called the Eskasoni has many legends of the “little people.” There is one particular hill in Nova Scotia where the Eskasoni claim the little people have lived for centuries. Many of the townsfolk warn their children against going to this mountain, for fear that the little people will take them away. Remarkable stories of the Eskasoni people coming into contact or encountering these “little people” can be seen in the film. The Shoshone tribe in the United States have their own name for the legendary little people: the Nimerigar. The Nimerigar were a race of little people who lived in the Rocky Mountains, specifically in the Pedro Mountains, and were also thought to live near the Wind River. The Shoshone believed that these little people were actually quite protective of their homes and would use bows and arrows as weapons. Of course, they were poisoned arrows. The little mummy found in the San Pedro Mountains is actually theorized to have been one of the Nimerigar who the Shoshone tribe so strongly believed in for many years. 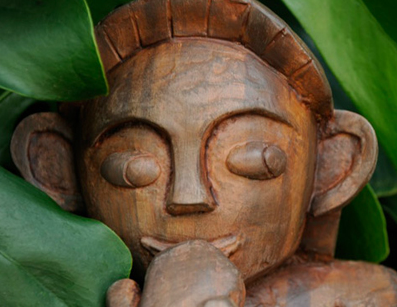 All the way on an island range in the Pacific, in our beautiful state of Hawaii, the Native Hawaiians also believed in a fairy race or “little people” that they referred to as the Menehune. Again, their beliefs are very similar to the Shoshone’s Nimerigar and the Eskasoni’s little people. The Menehune of Hawaii were thought to live in untouched forests and mountains on the Hawaiian islands. Legend has it that they were the main residents of the Hawaiian islands before Polynesian people came to reside there. They were also thought to have built the Menehune fishpond in Niumalu and the Kikiaola ditch near Waimea. Now, the Choctaw Natives also believed in the little people and called them the Kwanokasha. The natives were generally quite afraid of these little people. There was a legend that told of the Kwanokasha carrying away little boys to their caves in order to test their spirit. Three wise men would wait at the cave for the Kwanokasha and the little Choctaw boy, and they would present the boy with three things: a knife, a bag of poisonous herbs, and a bag of healing herbs. If the boy chooses the knife, he would be destined to be a killer. If he chooses the bag of poisonous herbs, he would only provide bad medicine to his people. But, if he chooses the bag of good healing herbs, he would be a very powerful medicine man to his people. Just like the Hawaiians and the Shoshone, the Choctaw also believed that the little people lived in caves. The Kwanokasha were thought to be between one to two feet tall. The Crow believed in little people that they called the Nirumbee. They were thought to have lived in the Pryor Mountains and may have given visions to Plenty Coups (an early twentieth century Crow chief). According to some Crow Natives, due to a vision that the little people gave the Crow Chief Plenty Coups, the little people are accredited with keeping the Crow people safe and together. It is said by some members of the Crow that, even to this day, if they pass through the Pryor Gap, they will leave offerings to the little people in remembrance of their aid to the Crow nation. There are many more legends of the little people told by dozens of Native American tribes. Many of them are very intriguing and include stories of how the little people came to the Natives’ aid in times of great need. Most of the time, the little people were feared, as they were unpredictable and mysterious to the Native Americans. In most of the legends (if not all), these little people looked similar and acted in similar ways. In my opinion, how can we discredit all of these cultures and legends, and merely brush off the idea of these “little people’s” existence? Maybe the fairies of Ireland and various places in Europe were simply a type of little people that the Native Americans believed in. Maybe, they weren’t fairies at all, but actual people who were quite small and knowledgeable in the areas of magic and healing. Whomever these little people actually are will probably never be known, but one thing is for sure: there are too many legends and beliefs in these little people to ignore the possibility of their existence. It is my belief and understanding that there were fairies in North America before the white man came, and those are the little people that the Natives speak of in their legends. But, I also believe that when the white man came over from Europe and other places, he brought with him some of the house/home and garden fairies from his native land. Some of these fairies that were brought over to North America from elsewhere could have included the Scottish Brownie, the Pixies, the Gnomes, and many more. This has created a melting pot of fairies in North America, very similarly to the way people have evolved on this continent. We have a melting pot of cultures, and so we, therefore, have a melting pot in the faerie realm as well. So what about in today’s age? Have the little people of Native American beliefs disappeared? Many people, both native and new to this continent, have had encounters with these “little people” or what many call faeries or fairies. I am one of those people. Even in my suburban home in the Tampa Bay area in Florida, I have had three experiences with the “little people” or faeries. And, I believe in them, to say the least. I don’t truly consider my real fairy encounters as significant as others’ when I compare them. My favorite fairy encounter story is one about a woman and her children. While the children were picnicking in the forest one day, the mother began hearing sounds of a very strange magnitude. It sounded unlike any music she had ever heard in her entire life, and she thought it was utterly strange, especially because she hadn’t seen anyone in the area, and no one lived in that area of the woods. The music got louder and closer and the mother asked her children if they heard it too. They said they did. The mother didn’t want to stick around to see what was making the strange, enchanting music, so she gathered her children and left. The little girl, who is now a grown woman, admits that there was something even stranger than the sound of the music that day. As their car was driving away from the site of the experience, she looked back (even though her mother told her not to) and she saw a circle of little people, all dancing together and looking quite merry! She didn’t tell anyone for years for fear that no one would believe her or that it would be bad luck to tell others about her fairy encounter. Another story is one told to me by a woman on HubPages about her when she was a little girl. The little girl and her sister awoke one morning to see a tiny group of fairies dancing above the wall of their toy shelf. They were tiny, with wings, and seemed to be quite friendly and happy. To this day, the woman swears that fairies indeed exist. 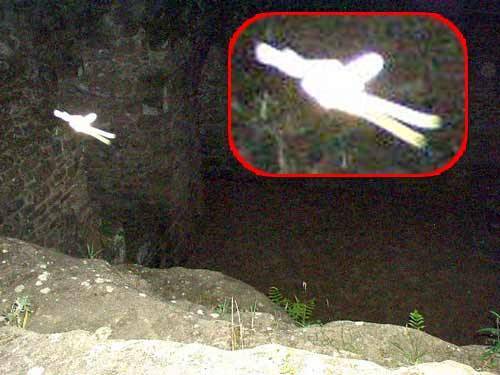 Are the fairies with wings related to the little people of Native American legends, or are they two entirely separate beings? Do the little people of Native American legends actually have some sort of ties with human beings or are they otherworldly beings? We might never find the answers to these questions. But, if you ask me…that is good. Why ruin a good thing? If we were to find a living little person or a living fairy, society and the world would simply experiment and exploit it until the magic was gone. So, for now, the idea of fairies and little people will remain alive in my imagination and in my reality, too. I don’t need science to prove or disprove their existence.